Excellent strings and quick shipping. These half flats rock! 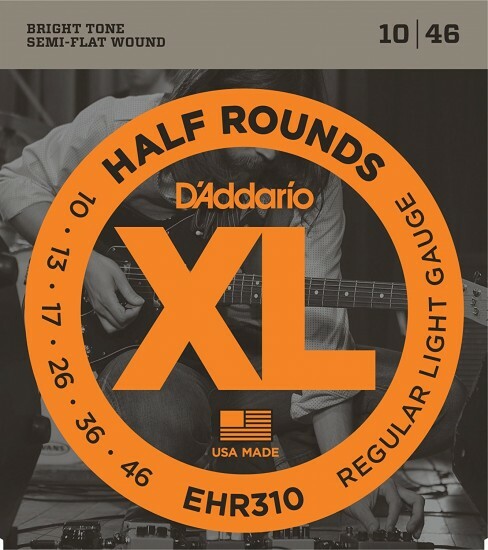 I wouldn't recommend the halfrounds for jazz because of the plain G instead of a wound G. Sadly the only .10 guage with a wound G that D'Addario makes is Roundwound. Other than that these strings are great. I've been using these string since practically the day they came out. The lack of that annoying "string squeek" is amazing. These strings are balanced and comfortable. They are great in the studio. I use them on all 8 guitars I own. Over decades of playing in 4 set per night cover bands I've only had 2 break on me ever. My gigs have included country, jazz, rock, pedal steel style bends, pop, R&B, and on and on. If I play 300 gigs a year or 50 I only change my strings once a year as these hold up, retain their tone and stay in tune. Among every musical product I've ever spent $ on these strings are the only thing I couldn't live without. Every electric guitar string seems to sound great, but the test comes in comparisons. I have many guitars and have tried many brands and types. These strings are my favorite for rock-n-roll and surf-rock, flat-picked or finger-picked, with most guitars. Fingerpicking is easier than with round-wound strings. D'Addario chromes are excellent too but their thicker higher tension makes them relatively difficult to fret. These have a rougher surface than the chromes--which are silky smooth--but smoother than round wounds; they're just about in the middle for friction.